Blog Content - Who am I? 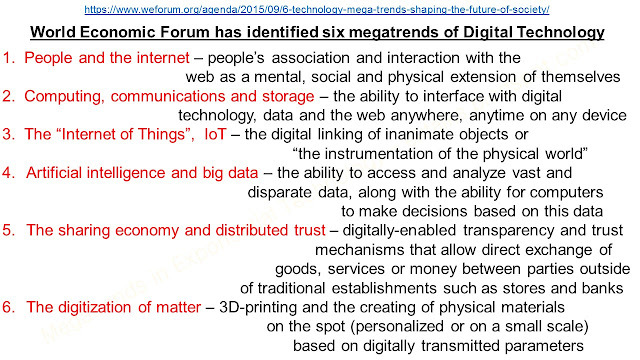 Some examples of megatrends: To introduce the subject, I start by mentioning three megatrends that are not technology driven but are well established. Megatrends are like supertankers whose direction is very difficult to alter - once established they evolve with time and their consequences require co-operative efforts from all nations of the world. a. Population increase will be highest in African and Middle Eastern countries who will be responsible for 50% of global population increase. Japan and Russia might actually see a decline of about 15%. b. 65 years or older will triple from 500 million in 2010 to 1500 million in 2050.
c. Spending power of the global middle class will increase from US$21 trillion in 2010 to $56 trillion in 2030. Middle Class in Asia-Pacific countries will increase their share from 24% to 56%. 2. Shift to Cities: Global urban population will increase from 3.8 billion in 2010 to 4.9 billion in 2030 and 6.5 billion by 2050. 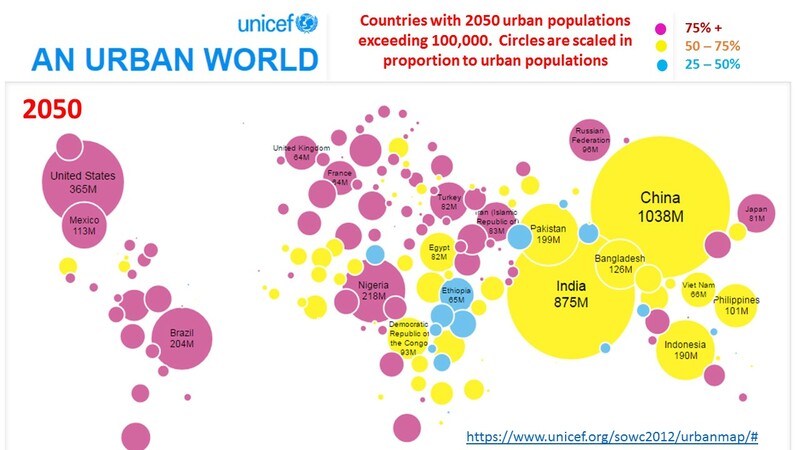 1.5 million people are added to global urban population every week. 3. Climate Change: Climate change will impact on agriculture and food resources, demand for which is expected to increase by 40 percents by 2030. Extreme weather will devastate many areas and rising sea levels will also seriously affect big cities near coastlines. Center for Global Development has an interactive website for mapping the impacts of climate change that is worth a visit and some mouse-work. Megatrends happen as a result of complex interplay between social, industrial, economic and technological developments. 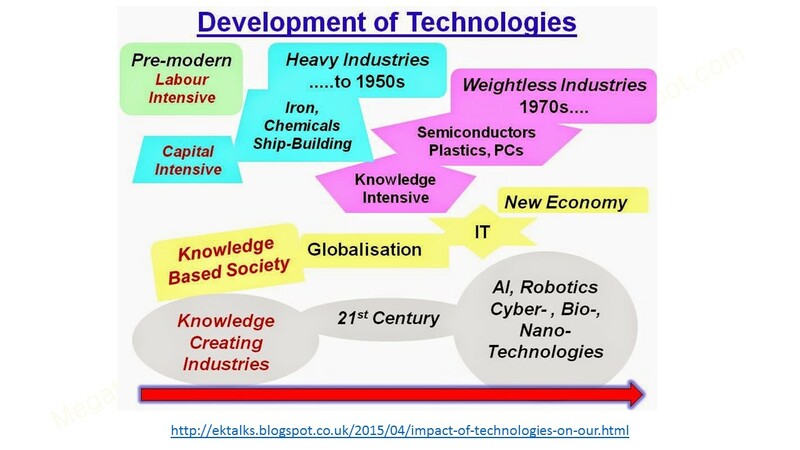 This blog concerns with megatrends engendered and supported by growth in technology and analyses how these impact our social, industrial and personal development. Not a day goes by when I do not come across the phrase - Technology is growing exponentially. To my mind, exponential growth eventually brings an unimaginable rate of change. Humans perceive the world in a linear fashion where things around them change in an incremental fashion and extrapolation over a period - days or even decades - may be easily perceived. This is how humans have lived since the beginning - the past 100 years excepted when consequences of exponential growth have been felt. A good illustration of exponential growth is to work out how population of a bacterial colony increases with time. A single bacterium that doubles in number every minute will grow to a population of more than a trillion trillion after one hour - half of these will be produced in the final minute! The increased technological capability feeds itself into our society in many ways - industrially, it becomes more efficient and cheaper to produce goods, a far greater variety of products are possible, social norms, medical care, transport, forensics, leisure will all be impacted. At the same time cybercrime, loss of privacy, psychiatric problems will be expected to impact the society in a negative way. It might be interesting to project how life might change in the coming decades. This might be a dodgy exercise as the exponential changes in technologies can create unknown unknowns that are things that we do not even know are possible but suddenly appear to have a major influence. Exponentially increasing technology has already reached a stage that, in many areas, it can improve itself without external human input - this creates a higher growth rate - called the accelerating growth - characterized by much reduced doubling times. 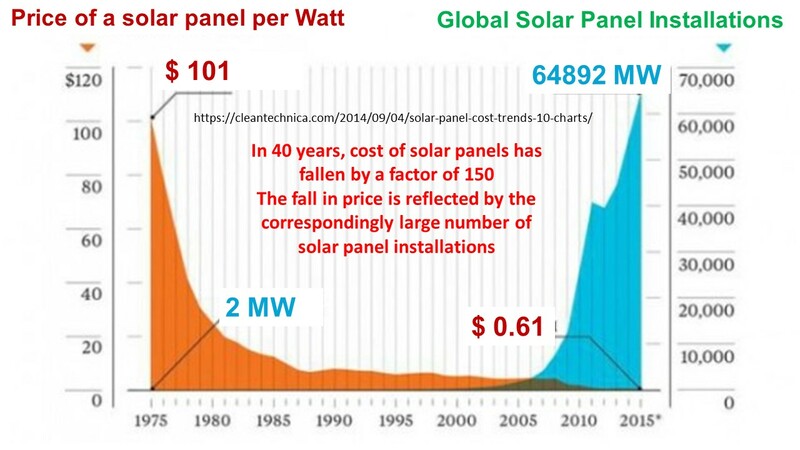 A consequence of this is that changes that we expect to happen in say 20 years time might happen in 5 years or even much sooner. Forecasting future becomes very difficult then. Historical Perspective: Past sixty years or so have been critical in terms of the transition from macro- to nano- technologies. 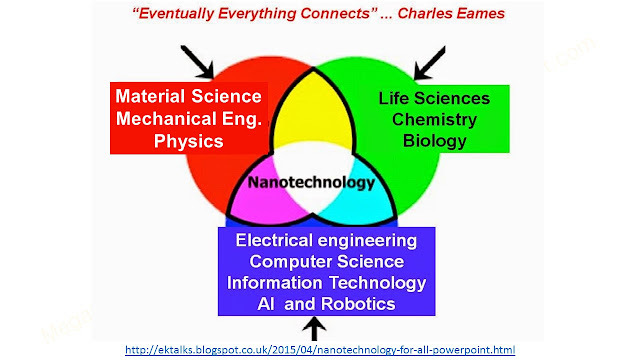 The three technologies - nanotech (NT), biotech/genetics (GT) and digital/cyber (DT) - will have profound impact on our future and will determine megatrends that is the subject of this blog. NT gives us the capability of handling and manipulating matter at atomic and molecular level while DT allows analysis, transfer and storage of large body of data. Active structures of devices in the two technologies operate at the scale of a few nanometers and have gained from a kind of beneficial symbiosis that has enabled their rapid development. DT is largely software-enabled; Micro-electronics and NT provide capability to miniaturize hardware devices. In not too distant future, the world and what people can do will be increasingly driven by software-enabled devices that will progressively become even smaller. The scale and speed of the changes driven by exponentially growing technologies will be difficult to absorb by our society. Biotech/genetics (GT) operates on truly molecular level and derives great benefits from the miniaturization of devices (NT) and superior analytical capabilities afforded by DT. Digital Technology: DT has already made a big impact on the society. 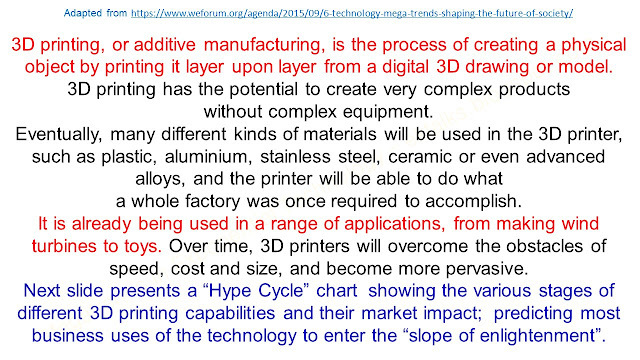 World Economic Forum (WEF) has looked at megatrends of DT in their 2015 report - this is accompanied by an extensive document. Let me briefly expand on these megatrends: Access to the internet is the primary means to communicate and share information. More and more people are using mobile devices to connect to the internet and this trend should continue. As devices become smaller, they will be implanted in bodies and serve a host of functions - communication, location and behaviour monitoring, health functions like measuring and sending health related parameters to health centers and automatically releasing healing medicines. In more distant future, implanted devices will be able to communicate unexpressed thoughts or moods by reading brainwaves and other signals. Connecting inanimate objects to the internet is a growing trend commonly known as the Internet of Things (IoT). Essentially, many objects in buildings will be connected to the internet - they can exchange their status and be controllable remotely. For example, the refrigerator in the house can keep track of what is in it and can order items automatically. Or light bulbs may be switched on and off remotely using Wifi. Homes and offices will become smart. There is a certain unease about IoT in terms of security. Legislation is not in place and most companies manufacturing connectable devices have not paid sufficient attention to cyber-security. In due course it is hoped that this problem will be solved and IoT will become ubiquitous. 3D printing allows products to be printed locally and on demand. Products can be made to personal specifications; e.g. particular shaped foot requires a specialized shoe size. Bottom-up fabrication will reduce energy costs and waste, will make goods cheaper and generate a lot of creative activity. 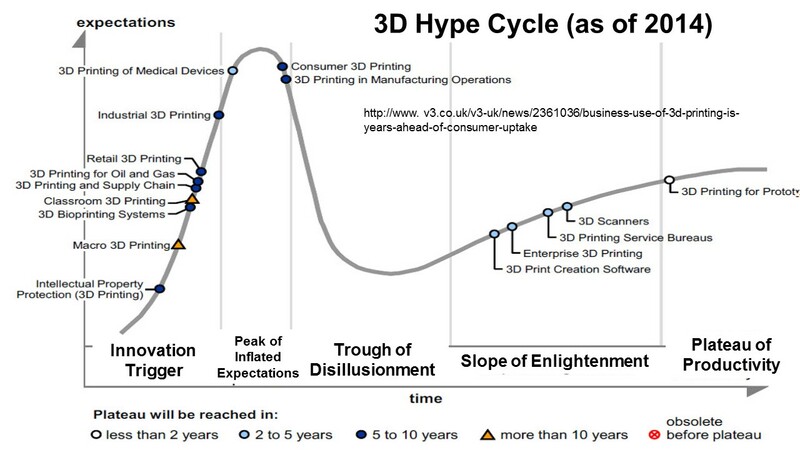 The major negative impact of 3D printing will be felt in patent infringements, piracy and product quality. It will be difficult to control production of offensive weapons etc. Bio-Printing: An organ may be printed layer by layer and can be customized in shape, size and even genetically to match the particular requirement. 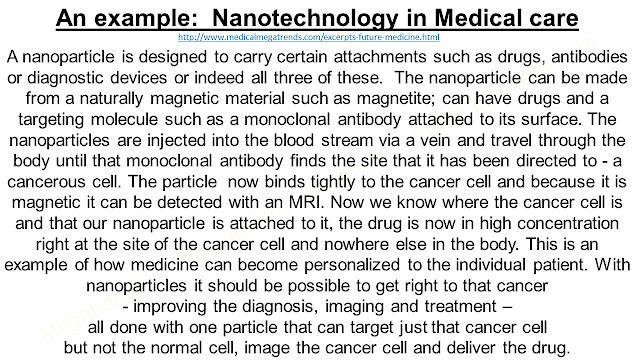 This will be a game changer in terms of human medical care. For example, the crown for a tooth can be 3D printed to fit exactly or prosthetic body parts. The negative aspects of bio-printing are to do with ethical concerns. Also, if any body part may be printed and replaced then there will be little incentive to look after your health. 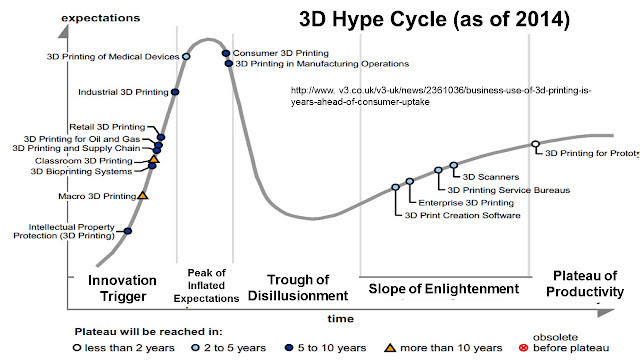 3D printing will have a serious impact on the way the society operates. Artificial Intelligence (AI) and Robotics: The trend here is of computers becoming more intelligent. The situation now is that computers are capable of performing some tasks at a superhuman level while being hopeless in solving anything else. This is artificial narrow intelligence (ANI) - we already have robots (which are really just intelligent computers) that perform a host of mostly industrially useful functions. With exponentially increasing technology, computers can achieve artificial general intelligence (AGI) and be as intelligent as humans in a reasonably large number of areas. AGI will then start to replace humans in many jobs - particularly in services and administrative support. It is possible that in the next 10-20 years half of the jobs as we have them today will be performed by intelligent machines (robots). This will create unemployment although alternate jobs will appear in leisure and recreational industries. TRANSPORT: Currently, our transport system is heavily reliant on fossil fuel - this has resulted in increased emission of green house gases (GHG) allegedly responsible for climate change. A shift from fossil fuel to electric vehicles (EV) is being talked about and in the next 30-40 years most cars on the road might be EVs. An additional change is that with increasing analytical capabilities of computers and sensors, driverless cars (autonomous vehicles - AV) are also being tested with promising results. These developments depend largely on our ability to store energy - battery technology - and a range of about 200 miles for EVs is achievable. The megatrend firmly points to the replacement of fossil fuel powered vehicles to EVs and then to AVs. The situation has changed dramatically in the past 50 years - it will be fair to say that we now have a good understanding of the molecular basis of living systems and the causes of disease. The most important development in medicine in recent years has been the understanding of the human genome. 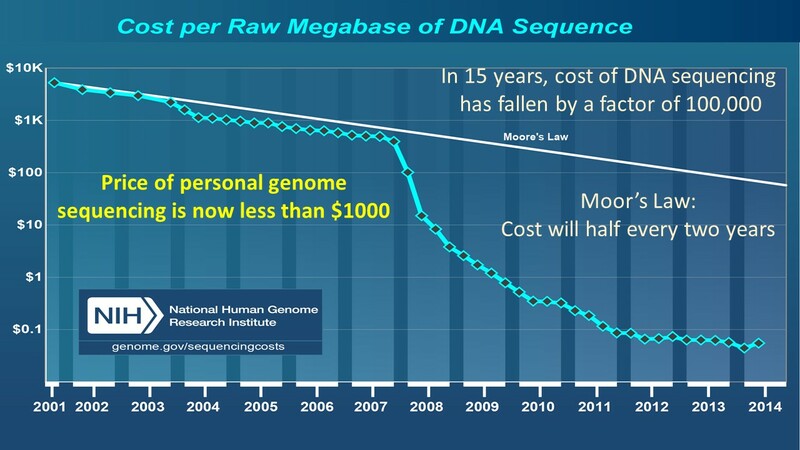 Technology now allows mapping 30,000 genes of a human genome for about $1000. This has opened up the possibility of genomics medicine - the doctor instead of detecting and treating a disease can now focus on predicting and preventing it. Based on individual genomic information, the doctor can select a medicine that is active and safe for that person - the specificity will deliver the maximum efficacy in the treatment with minimal side effects. Many diseases like sickle cell anemia are caused by a defective gene. In gene therapy, a new gene is introduced in the genome to replace the defective gene and cure the disease. Gene therapy will be increasingly used in the future. The newly discovered gene editing technique CRISPR is easier, faster and cheaper than previous methods of modifying DNA at precise locations. CRISPR will allow permanent modification of genes in living cells and treat genetic causes of disease. CRISPR has implications for everything - from treating cancer and other diseases, eradicating genetic malfunctions that cause disease, to increasing crop yields or creating efficient biofuels. We shall see growing application of CRISPR in the next decade. Molecular Imaging and Nuclear Medicine: Until recently, medical diagnostic imaging methods - X-rays, ultrasound and computer aided tomography (CT) - had offered high resolution images of anatomical structures and have been valuable tools. Molecular imaging provides detailed information of what is happening inside the human body at the molecular and cellular level - it actually tells us how the body is functioning and measures chemical and biological changes happening in real time. For an outreach course on medical imaging click here. Molecular imaging offers unique insights inside of the human body without the need of biopsy or surgery. It can locate disease like cancers in the earliest stages, often before symptoms occur. 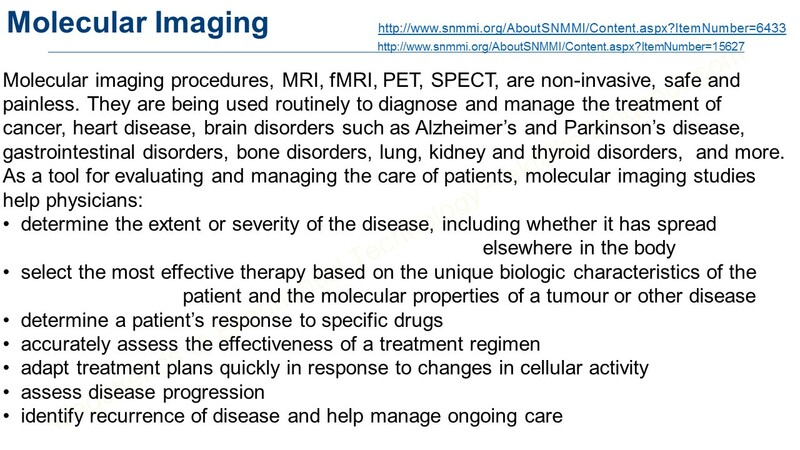 Molecular imaging includes the field of nuclear medicine which uses very small amounts of radioactive isotopes - radiopharmaceuticals - to diagnose and treat disease. 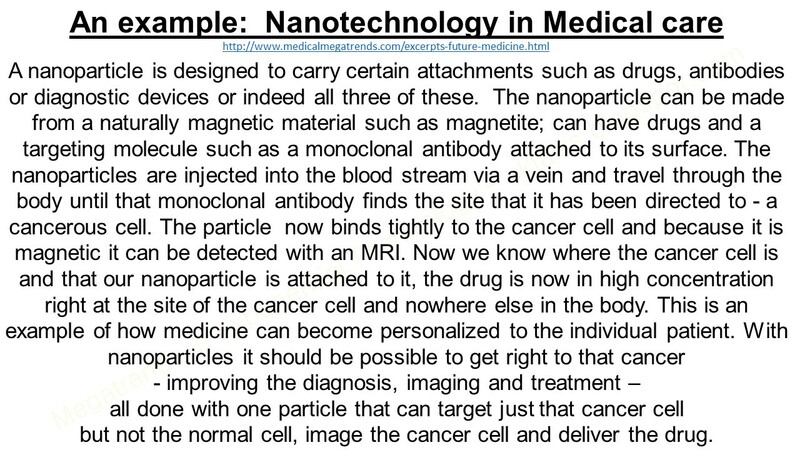 Megatrends in Nanotechnology: A nano or nano-meter is one billionth of a meter. 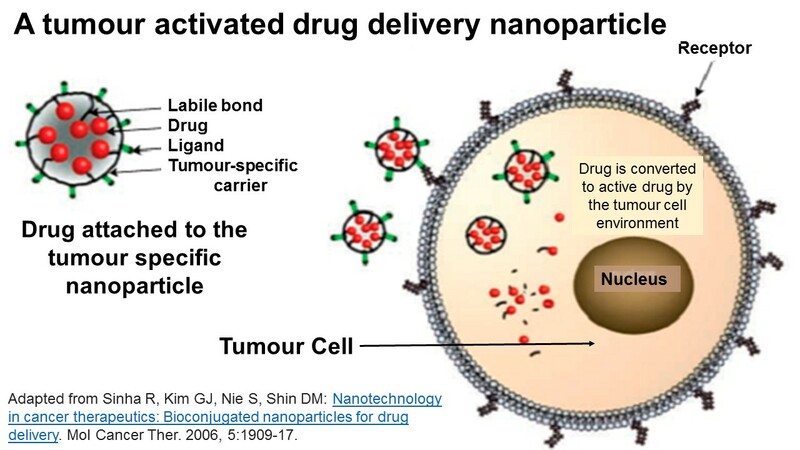 NT is the study, design, synthesis, manipulation and application of materials and devices at nano scale. NT will create devices with unique properties - devices will be faster, lighter, stronger, more efficient and cheaper. Materials at nano scale show entirely new phenomenon and properties - nano-particles (NP) have very large surface area and can be millions of time more reactive than macro scale matter. Additionally, matter at nano scale is largely governed by the laws of quantum physics and behaves very differently from ordinary matter. I have described how NT is already having a serious impact on medicine and to some extent on digital technology by reducing device size. In a more general context, NT will affect all aspects of our life. Nanoparticles are excellent catalysts, superb lubricants, are used in self-cleaning window glass, suntan lotions, bullet-proof vest, and many other industrial applications - too numerous to list. See also. NT will make bottom-up manufacturing feasible and reduce waste enormously. 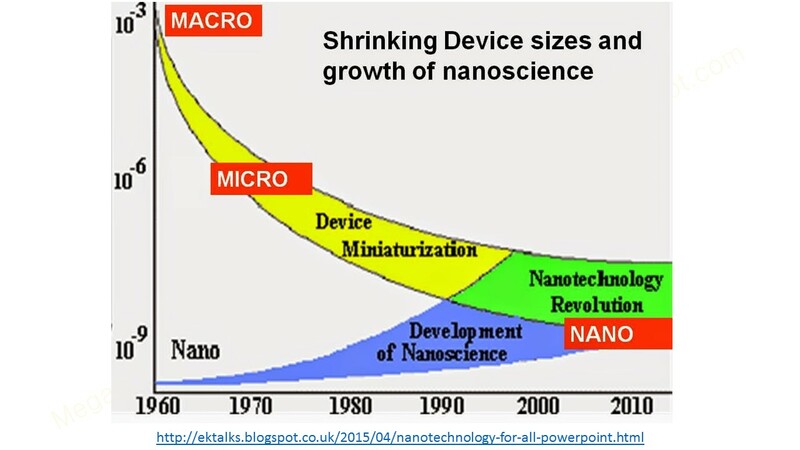 Miniaturization is driven by NT - we can have nanometer size machines, computer memory chips, sensors of all types. The megatrend of NT making inroads into the way manufacturing, medical care, communications are performed is firmly established. 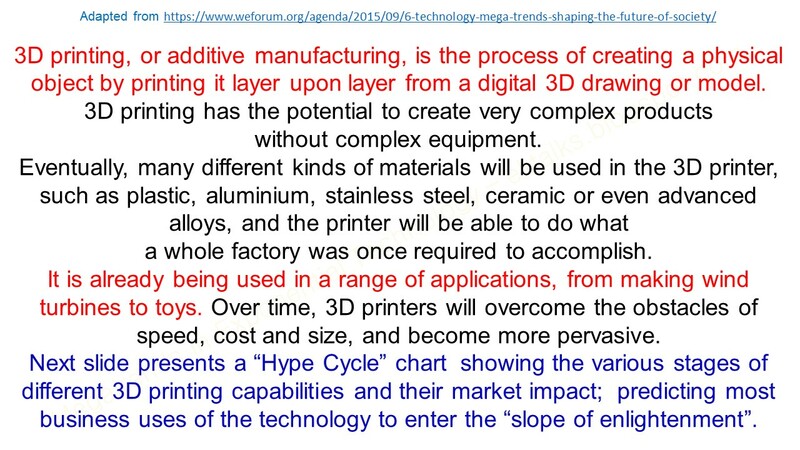 FINAL WORD: Megatrends I have discussed here are not predictions or fiction. These are trends that are firmly established and will happen over the next few decades. What is not certain and difficult to say is the way the accelerating growth in technology might impact these trends - by making them happen quicker or springing surprises that can make these megatrends obsolete even before they have run theri course. One thing is for certain - future will be interesting and our civilization will not be prepared for the changes to come.